Before you think about using Purple Parking promo codes, holidaymakers might have a number of questions about exactly how airport parking works. It’s completely understandable if there are concerns about leaving your car under the care of others for a long period of time, and this isn’t help by the many scare stories about disreputable parking providers. However, with a company like Purple Parking, you are not only getting a long history of offering secure spaces for both individuals and businesses, but also a travel operator that is focused on giving you peace of mind as well as a great price. With our exclusive 9% off parking code you can get great savings on car parking at over 25 UK Airports. To activate your 9% off Purple Parking voucher codes, just click here or on the image below to get this great deal! They’ve been in the automotive industry since 1925, first starting out as a small chain of self-service petrol stations and garages in west London before expanding to offer storage facilities for new car dealers. Parking spaces was a natural progression, and thanks to their location close to Heathrow Airport, their first airport Park and Ride service was opened in 1990 with a Meet and Greet service following 5 years later. The original company was then re-named and now Purple Parking voucher codes offer customers the simplest way possible to book and save on their much-needed parking space. Holidaymakers need reassurance as much as they need a decent price on their airport car parking, and when booking short or long term parking with Purple Parking voucher codes, all their concerns can be alleviated. When it comes to security, all Purple Parking car parks are covered by the most up to date surveillance technology and are holders of the ‘Park Mark’ Safer Parking award, a guarantee that their car parks have been vetted by police and their security reaches the standard required. This parking provider also appreciates that different customers require different types of parking services, and a Purple Parking discount code lets you save on several options including Purple Parking Meet and Greet, their ever-popular Park and Ride service, and pricier bookings such as long stay parking at Heathrow. And with many travellers now looking to organise additional facilities once they get to the airport terminal, Purple Parking promotional codes also cover airport lounge bookings, airport hotels, holiday car hire and travel insurance, with the company partnering with other travel operators such as Holiday Inn and British Airways. With many UK customers departing from either Heathrow or Gatwick, it’s understandable that Purple Parking promo codes prove very popular with those who use these south-east hubs on a regular or annual basis. But that’s not say that a Purple Parking discount code can’t save travellers money on other UK airports too. 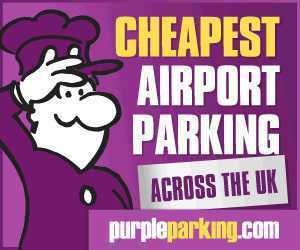 In fact, Purple Parking now has domestic airport parking facilities available 25 airports up and down the country including the large regional hubs of Manchester and Glasgow as well as smaller airports like East Midlands and Leeds Bradford. There a number of different email addresses available depending on your reasons for getting in touch with Purple Parking, but if you have a question regarding a reservation already made with Purple Parking promo codes, send your query to reservations@purpleparking.com, or to amend an existing booking, you can contact them at changes@purpleparking.com. To speak to a Purple Parking representative regarding either of these issues, you can also call on 0845 450 0808. To send postal correspondence to the Purple Parking head office, please write to Purple Parking, 169 Brent Road, Southall, Middlesex, UB2 5LE. One thing we can all do with every now and again is more travel advice and there are links to holiday features and tips on the Purple Parking Facebook and Twitter pages along with news of their regular competition that gives lucky customers their parking fees back. And on the latter, you can also contact them with any queries you might have about your Purple Parking discount code, booking or airport parking experience.